Ganache (v1.2.3) provides a list of 10 accounts. They can be easily selected by selecting web3.eth.getAccounts();. However web3.eth.accounts returns undefined as shown below. Not sure how to select just one account here. 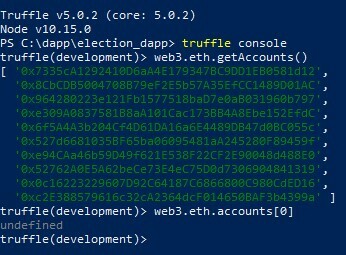 The new version of Truffle v5 uses web3 v1.0 which has web3.eth.accounts as a module. The web3.eth.accounts contains functions to generate Ethereum accounts and sign transactions and data. Another change in web3 v1 is that most functions are async and return a promise. To obtain a value you can await for it. Get the public address & key associated with one of the Ganache accounts using Web3.js? How can I use an account created on a webpage?